Find Better Ideas, Faster ® with a custom motorbike trend report, our PRO Dashboard and 80+ categories of premium trend reports. A myriad of motorcycle designs and styles are showcased in the Motorbike Trend Report. We sift through and find the most innovative and attractive vehicles, both beloved and new. Vintage and retro motorcycles appeal to the nostalgia in bikers, while hybrid engines and modernized choppers are far more contemporary. We also look at biker fashion, like the reinvention of the leather jacket or motorcycle boot footwear. This trend report is geared toward auto designers, specifically motorcycle designers and engine developers. 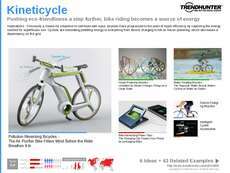 We also have curated data that will help designers and marketers of electric bikes. Finally, fashion designers and leather retailers will find this crowdsourced data useful. The Motorbike Trend Report covers the chopper styles and designs that appeal to eco-conscious consumers as well as lovers of nostalgia.